Attending CAR is mandatory for anyone and everyone in the auction industry! It’s where remarketing is defined and connections are made. It’s the only gathering where the industry decides on initiatives and establishes partnerships. Over 500 remarketing professionals attend each year to get the latest information on new technologies, wholesale market conditions, industry standardization and more. 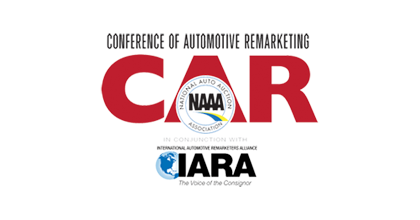 CAR is organized with the National Auto Auction Association (NAAA) Spring Business Meeting and the International Automotive Remarketers Alliance (IARA) Spring Roundtable.